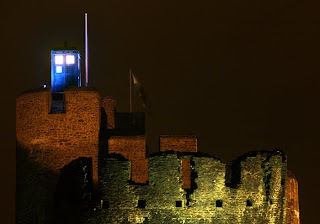 No, you're eyes do not deceive you; The Tardis is indeed parked on top of Caerphilly Castle. You can imagine my surprise when spotting this as I was strolling past, minding my own business. I've done a spot of 'googleing' this morning, but alas; no information as to what the dear Doctor is doing in my hometown. Still, it made a great shot - even if I did risk my gear as I stood there praying that the heavens would put off bucketting down on me. Lets just hope that's all he's brought here mind; I've had one hell of a year and right now I would prefer not to be caught up in some inter-dimentional battle between a bunch of planet stealing, other-world nutters... Mr Who - You may have survived all manner of nasties and made it to a whopping 903 years old, but if you want to see you 904th birthday I suggest you make sure I get a peaceful christmas.